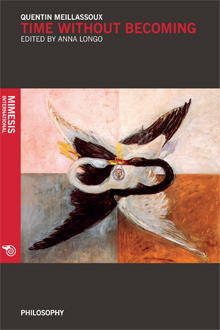 Time without Becoming is the text of a lecture Quentin Meillassoux gave at the Middlesex University in May 2008. He makes a summary of the arguments he employed in After Finitude to overcome correlationism from the inside and to dismiss philosophies of becoming, such as absolute idealism and vitalism. In particular, he explains the specificity of his “speculative materialism” by supporting the thesis of the reciprocal exteriority of matter and mind. In her contribution, Anna Longo challenges this perspective taking into account the issue of the genesis of the transcendental in Gilles Deleuze’s philosophy. Quentin Meillassoux is a French philosopher. He teaches at Université Paris 1 – Panthéon Sorbonne. His influential After Finitude provoked the anticorrelationist awareness which characterizes the realist turn in contemporary philosophy. Anna Longo holds a PhD in Aesthetics from Université Paris 1 – Panthéon Sorbonne. She is the co-editor of Breaking the spell, an anthology on speculative realism and its legacy.